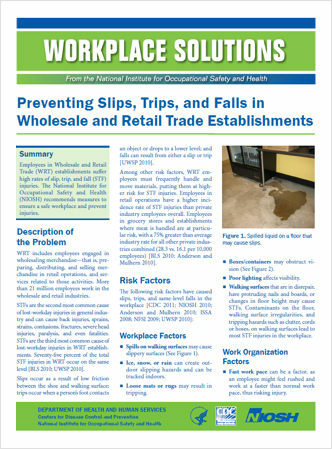 A NIOSH publication (.pdf file) addresses preventing slips, trips and falls in wholesale and retail trade establishments. Slips, trip and falls – the third most common cause of lost-workday injuries in wholesale and retail trade – occur due to factors such as slippery surfaces; loose mats or rugs; poor lighting; employee fatigue; and inappropriate, loose or poor-fitting footwear, according to NIOSH. Ensure aisles are free of clutter and other tripping hazards. Provide cleanup supplies at convenient locations in the facility. Place water-absorbent mats near entrances and areas where water, ice or snow may be tracked onto the floor. Train employees on identifying and preventing slip, trip and fall hazards. Push (rather than pull) carts to allow a better line of sight. Walk with caution and make wide turns at corners. Clean surfaces as soon as they become wet. Place warning signs in wet floor areas and remove them when floor is clean and dry.